I feel bad for Guillermo del Toro. That’s hard to do for a guy who was given $190 million and told to create a movie with huge robots and aliens, but it happened. “Pacific Rim” only made $38 million domestically its opening weekend, which puts a sequel in limbo. It will be a shame if the truly gifted del Toro must fight for another Pacific Rim installment because it seems like the vast majority of people who saw it exited the theater entertained. It’s also a shame that actors like Ron Perlman often decide the best PR move they can make for a movie is to pick political targets and then say really mean things about them, which effectively annoys throngs of potential customers. Celebrities often speak glowing of nonviolence, castigating anyone who would consider striking back against an opponent rather than talking things out. 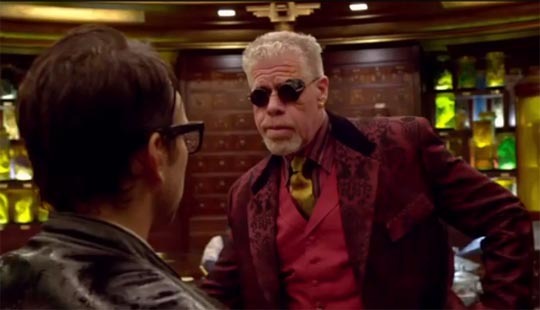 Ron Perlman, famed for playing Hellboy in two films as well as for his colorful turn in the new adventure Pacific Rim, doesn’t mind advocating violence. It just has to be aimed at the right people—like a star from the GOP. The character actor interrupted his own tweets about the plight of Detroit, a city under the grip of Democratic rule that just declared bankruptcy, to slam a Republican. Btw, every day somebody doesn’t punch #DarrelIssa in the mouth is a dark day in #America!! But I digress…Whudda we want? #BringBackMotown! So, according to Ron, it would be sunshine and lollipops in America if people went around punching Darrel Issa and perhaps his political allies? Maybe Mr. Perlman was just “joking,” in which case the question becomes: “Is it productive to casually joke about punching strangers in the face — particularly after the George Zimmerman trial?” Does Ron realize that punching strangers in the face can lead to more violence, including death? Ron Perlman has deleted his tweet, but the internet is forever. When you say mean things, screenshots happen and bloggers write about it. “I would like to be [neurally] linked with Obama. I think he’s the smartest dude in the world, and he’s always the coolest dude in the room. He has a vision of how he’s trying to steer the country and there’s a certain nobility to it. I don’t have his kind of discipline cuz when I hate, I hate big. But Obama just has this even keel that’s amazing, but he’s still very passionate. He’s egoless. I don’t think he aspired to be a powerful man, I think he aspired to make a difference,” (Ron Perlman, Interview with the Urban Dirary, July 12, 2013). There you have it. At least Ron is honest: He hates. In fact, he “hates big.” And then he takes to twitter to infect others with his hate because even people who wallow in the worst forms of energy like company. In regards to President Obama’s “nobility” (Aren’t we supposed to be living in America?) and “egoless” nature (Last time I checked, everyone has an ego, especially a man or woman who runs for president), I’ll pass on deconstructing the idol worship and instead ask: How scary would it be to put a man like Perlman — who “hates big” — in the White House? Tonight I was supposed to write a review for Pacific Rim. I wanted to put together a post that did justice to all the reasons why it’s a worthwhile movie to pay for while it’s in the theaters. Instead, I’m writing about Ron Perlman’s “hate” manifesting itself into ugly tweets about punching political opponents. My creative pool was temporarily poisoned by his anger, and by the time the muddy cloud of Perlman vitriol dissipates from my mind it will probably not be worth writing a review. Lao Tzu once said: “What is a good man but a bad man’s teacher? What is a bad man but a good man’s job?” Given that, I will take this moment to impart some knowledge Mr. Perlman’s way. I hope he is open to it. You have a choice in every moment, so you can decide to be a host to God and carry around with you the calmness that is the Tao, or you can be a hostage to your ego, which insists that you can’t really help feeling disorderly when you’re in circumstances that resemble pandemonium … You have the innate ability to choose calmness in the face of situations that drive others to madness. Your willingness to do so, especially when chaos and anger have been your previous choices, puts you in touch with “the master of unrest*,” (Wayne W. Dyer. Change your thoughts, change your life. 124). * Note: “the still” is the master of unrest. If you have some time and some extra change in your pocket, check out Pacific Rim. If Mr. Perlman’s behavior has you thinking about withholding your hard-earned cash, I can’t blame you. Just don’t punch him in the face. Unlike Ron, I do not advocate such things. Yeesh. Another Hollywood moron who should just keep his mouth shut. I still want to see Pacific Rim, though… but will probably wait until it’s out on DVD now. This comes at the same time as both Samuel L. Jackson and Jamie Foxx voiced their opinions about the Trayvon Martin/George Zimmerman trial… at Comic-Con, which I thought was supposed to be a place where you have fun and escape from things like real-world politics. It’s called Comic-Con (though it barely even focuses on comics these days, it seems), not RacialPoliticsCon. First it was Joss Whedon and his idiotic anti-capitalist rants at last year’s Comic-Con, and now this nonsense. I also see that you dealt with someone who acted as an apologist for Perlman on Twitter… kind of like the LIV fanboys you and Hube encountered while calling out comics writers for their idiocy. I’ll have a post of my own up tomorrow that will touch upon some of that stuff, my usual news round-up that I haven’t done in two months. I’m glad you checked out Twitter. She deleted all of her tweets shortly our exchange, which was telling. Ron followed suit, which threw my timing off a bit. I started the blog as soon as I came home from work, but forgot to email the screenshot I took from my work station. Luckily, Twichy was around! It’s called Comic-Con (though it barely even focuses on comics these days, it seems), not RacialPoliticsCon. As they say, Doug, the internet never forgets. Some people forget there’s a little thing called screenshot that can capture what they’ve written even if they delete it. Yeah, with the current state of Comic-Con, I wouldn’t go there. I don’t have the money to afford a trip to San Diego, let alone Comic-Con. I don’t even go to the local conventions for the same reasons. Plus they’ve strayed so far from what they were originally about that it discourages me from wanting to go at all (and I hate large crowds, too). I mean, Hollywood has taken over the whole thing and now it’s basically Holly-Con. It was supposed to be about comics, sci-fi and fantasy… but now even things like Breaking Bad and Downton Abbey have panels there, which makes me sad. Not to mention the actors/writers and other celebrities using it as a political forum, which is frustrating because conventions are supposed to be an escape from reality. LOL. That’s pretty much it… at least if I were an attendee. Although if some of the attendees are anything like the fanboys we’ve encountered, they probably agree with Jackson on “Stand Your Ground,” unfortunately. Put a smile all over the place and have the Hell’s Angels punch Clay Morrow in the face.